As Mardi Gras festivities reach their peak, locals contend with the tens of thousands of pounds of beads that end up in the city's drainage system. 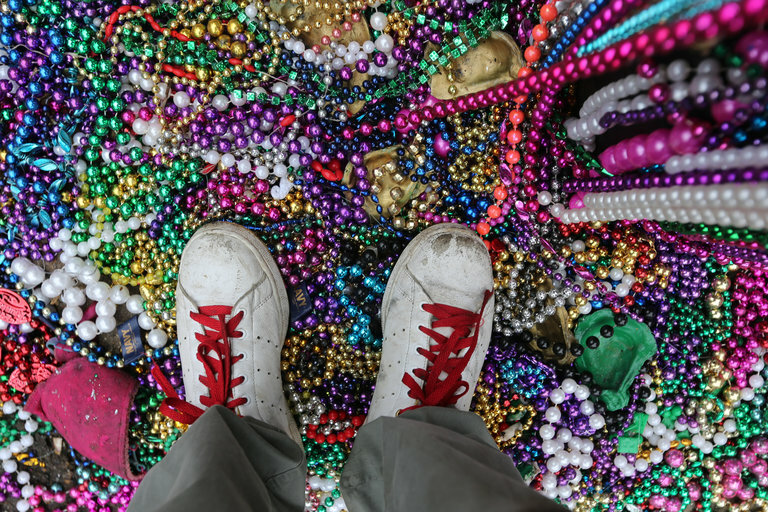 A recent discovery of tons of Mardi Gras beads clogging the New Orleans drainage system may boost efforts to recycle the trinkets. Yes, the good times are rolling on the Gulf Coast as Mardi Gras reaches its peak on Tuesday. The celebration — a last blowout before the austere Christian season of Lent — packs the streets with revelers hoping to catch strands of plastic beads or other souvenirs. Other cities on the central Gulf Coast, which was colonized largely by the French, have Mardi Gras celebrations. But they don’t have the same geography and infrastructure problems as New Orleans, which depends on a network of pipes, pumps, and basins to keep it dry. And crews trying to keep that system flowing hauled more than 93,000 pounds (42,000 kilograms) of beads out of catch basins lining a five-block stretch of one downtown artery, a city official told reporters in January. With the carnival season upon them, many in New Orleans are hoping to keep those basins from filling up again. The Arc of Greater New Orleans, a social-service agency that works with people with developmental disabilities, has run a bead-recycling program for several years. This year, it has partnered with the city’s Young Leadership Council to start trying to collect them immediately after a few weekend parades. “You see beads in the trees and on the power lines and along the sidewalks, so it’s really obvious that there are tons of beads thrown away or that never make it home,” Stephen Sauer, the agency’s executive director, told Seeker. Sauer said the Arc recycling drive started with concerns about the beads piling up in landfills or leaching hazardous chemicals from their colorings. But when the stories about them landing in catch basins appeared, he said a light bulb went off for many people. The Arc takes in beads after the parades end, cleans them up and repackages them for sale the following year. Sauer said collections have “skyrocketed” over the past two years, and it sold about 250,000 pounds of beads back to the public last year. New Orleans exists through a precarious balancing act between nature and human development. Not only does it sit below sea level, but sea levels are rising about 3 millimeters a year — a rate that’s expected to increase in an era of climate change. It’s also sinking further every year. Coastal Louisiana is sinking an average of about 9 mm (about a third of an inch) a year, the result of decades of flood-control projects that cut off the supply of fresh Mississippi River sediment to the lands beyond the levees. And while Hurricane Katrina in 2005 demonstrated the city’s vulnerability to a catastrophic storm, a 10-inch downpour in August overwhelmed the drainage system and led to widespread flooding. That led to “block-by-block” push to clear the 1,500-plus miles of drain lines and 65,000 catch basins that lie under the city’s streets, said Chris Dalbom, program manager for the Tulane Institute on Water Resources Law and Policy. A string of pump stations draw the water from the basins and into canals that empty into Lake Pontchartrain and other nearby waterways. “Our catch basins for storm drains were designed in a certain way several decades ago, and since then, we kind of let them go and restricted a lot of the flow to them through roadwork or through parking on them, or just general neglect,” Dalbom, a geographer-turned-lawyer, told Seeker. The city has started to address some of the issues. “But we clearly didn’t get to them in time,” Dalbom said. Crews have been mucking out the system for months, turning up not just beads but construction debris, concrete rubble, mud, and vegetation. New Orleans gets an average of 63 inches of rain a year, and climate change is expected to raise the odds of downpours like last year’s — or the August 2016 cloudburst that flooded nearby Baton Rouge, killing 13 people. While the city has laid out a plan to address the expected effects of climate change, Dalbom said restoring the existing system is a prerequisite for any future goals. “Not only is it sort of low-hanging fruit, but it also is the thing that needs to be done before we can even get to some of those other questions,” he said. But tackling the subsidence issue is “the next big thing” the city needs to address. And Dalbom said some krewes — the societies that mount the parades — are tossing out a wider variety of items, which could mean fewer beads ending up in the basins to start with.